This is How to make poses in Second Life, part 2! 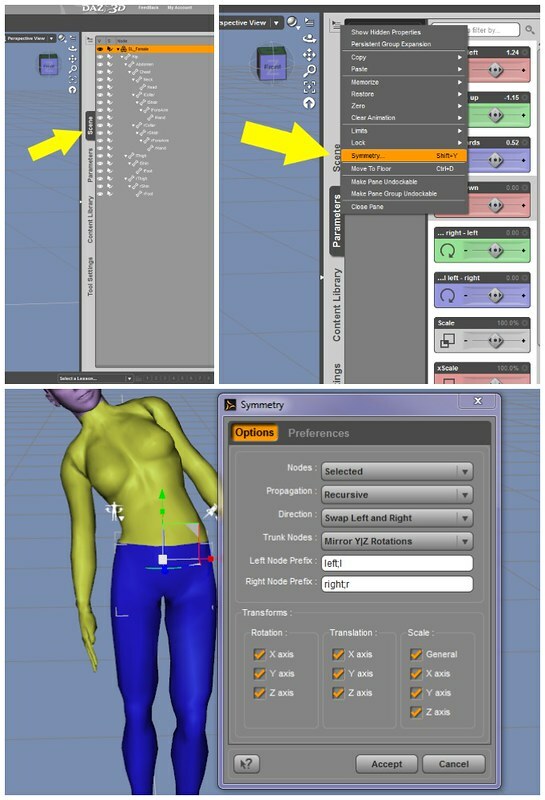 I will show you guys a super easy way to mirror poses in DAZ Studio (version 4.6). Big thanks to Melanie, who showed me how to do this last year! 1. Select the figure in the Scene Tab. 2. Click on the ‘Active Tab’ options button on the Parameters Tab. This button is in the upper right corner of the tab. Instructions modified from the How to do Mirror Symmetry DAZ3D tutorial to work for SL. I made two poses and mirrored them for fun! Maybe some day I’ll package these tutorial poses and put them on MP! Qavimator (another pose making tool) has a mirror toggle in the menu. Been tempted to make some poses myself. Just did one, the upper torso and one of the legs turned out okay but the other leg made me lean funny. Very cool, I wish I had the patience, you should definitely package them up and throw them on MP though, I’ll buy them! I love your tutorial – thanks to you I am starting to learn to make poses in Daz. But I have a question – I have issues with some of my poses making me float off the ground. Have you had this issue before? I tried in Daz to use Ctrl-D which brings my figure to the floor, however upon loading the pose in SL, I still float. Is this due to mesh feet/shoes and so on? Is there any fix? Any tips would be appreciated!